why wait that long? get with Chase and arrange a check ride now in TT. I am not a big COTA fan. WGI and COTA are the same length. My best at COTA is 2:26.x and my best at WGI is 2:00.86. WGI just flows so well. WGI is my favorite track. Next and it's close is VIR and LRP. Since LRP is so far and is muffled most days, realistically, its VIR. I loved Road Atlanta but only have one day. I'll add Mid Ohio this May and go again in September. Hallett is awesome as well. TWS (rip) was the best track in Texas. Fact. Change my mind! NOLA isn't terrible but I live 40 minutes away and am usually scheming on how to go to Road Atlanta, VIR or WGI. I look at the data and the biggest difference that I see is that you over brake almost every turn compared the reference car. Some of that can be tires. As mentioned, add a math channel for braking. It's basically this formula ->> abs(if(EQ(LT(-GPS_LonAcc,0.2),0),-GPS_LonAcc,0)) I bet you actually get back to full throttle sooner as you over slow. I suspect, when you start looking at brake data, you will see that your initial spike is much higher, starts sooner, and is possibly longer. I have come to learn over the last 12 months that most improvement comes from improved braking (usually lighter) vs getting back to power sooner. Go with a C5. 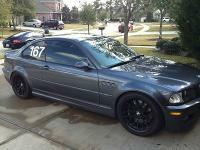 I have an E46 M3. It has many failure points. It takes a boat load of mods and effort to get 330 to the wheels. I think you got a 1:42 or better with that setup. You need to hustle more through the small transition bits. A few specific things to try next time: * enter diamonds edge a little more right. That is, displace the first curb by a couple of tire widths and take the second curb about two feet later. The idea is to get to full throttle a second or so sooner. You should be hitting 130+ at the end of back straight. * brake a wee bit less at the sweeper and carry more speed. I can sometimes get back to full throttle in that bit. It will bring you to mid track just before bus stop but that’s ok. You do not have to be far left. You trail brake anyways to rotate the car. * I can’t tell since you don’t have throttle trace but make sure to go to 100% throttle in the straight section between bus stop and key hole. I thought the overall lap looked fine. Start with the low hanging fruit - brake a bit deeper, don't coast before braking. Hustle a bit more in the bus stop. With respect to line, the only place I do it differently than you is through the carousel. I try to stay more inside through the first 1/3 and then let the momentum carry me further to the right through the final 3rd. I am kind of chicken coming on to the front straight. I don't straddle the left curb and probably never will. Looks to unsettling to me, though I am sure its slightly faster. I won’t have dyno until MSRH. Engine has been rebuilt. Basically. But I am not trying to win or set records. I’ll be running TT3 for nats.